December | 2011 | Is this thing on? Friday afternoon the IUPUI Jaguars will look to enter the Christmas weekend with a four game winning streak. What a difference a few wins and consistent practices can make. Todd Howard and the Jags will face long time rival Valparaiso on Friday afternoon at the newly named Bankers Life Fieldhouse, formerly Conseco Fieldhouse. As a matter of fact the Jags closed down Conseco with a win Monday night over Ball State and look to become the first winner at the big bank. Before we get to the nice “W” over the Cardinals, let’s find out why the Jags are winning. “Practice has been the big key and we are getting the chance to get better at practice and not at a shoot around the day of the game.”. Coach Howard put his team through a rugged stretch in November and he realizes the team is getting better with some time off. “When we first faced Ball State it was during a time where it felt like we were playing a game once every three days. It caught up to us physically and we lost some practice time.”. The first BSU game was in the middle of a stretch where the Jags played 6 games in 14 days. At the time coach Howard was trying to find the right rotations while his three experienced seniors learned to play with multiple newcomers. They were prepared and more than a few people told me it was the Jaguars best performance of the year. They worked together on defense and offensively the extra pass was always made. That has been the big key during this winning streak. IUPUI has not been forcing up shots and instead finding the hot hand or open shooter. In the first half against BSU the hot hand belonged to Ian Chiles. He scored 15 first half points, only two shy of his career high. His 6 for 9 shooting kept IUPUI in the game and his three just before halftime put the Jags up for good. The second half belonged to Gaines and Alex Young. Gaines cleaned up the offense glass and Young showed the faithful from Muncie why he is the Summit League preseason player of the year. In the first meeting AY5 was 3-15 scoring only 9 points and left Ball State unimpressed. I remember leaving the gym and having a couple of people close to the BSU program ask me why he was the POY. At the time there wasn’t much to say because he was struggling, but I assured them he can play at a high level. As I left that night I was hoping he would show them just how great of a player he is. Well, he did that and more on Monday. BSU watched him go for 22 points with 17 in the 2nd half. He scored, rebounded (9), and blocked shots. A complete game that really pleased one particular NBA Eastern Conference scout who was there to see Mr.Young. Now the Jags put their modest 3 game winning streak on the line against Valpo Friday afternoon. Is will be the 23rd all-time meeting and the first since 2007. The former Mid-Con (before it was the Summit League) rivals had some memorable battles during the regular season as well as the postseason. The Jaguars are 7-15 all-time against the Crusaders who left the Mid-Con to join the Horizon League. This series is a home and home with IUPUI traveling north on I-65 next season. Why is this game at the Fieldhouse? The schools would have played at the Jungle, but in the end decided on the Pacers home court. What a great venue for IUPUI to showcase the school and their skills. The Jags are now 6-4 at the Fieldhouse and have won three straight plus 4 of their last 5 on the NBA floor. The Jags first ever game at the Fieldhouse was a 64-61 loss to Valpo back on February 3, 2005. I hope you can make it on Friday afternoon. If you can’t get away then you can hear me on the call beginning a 12:50. The name on the building is new, but it is still the same great Fieldhouse. I want to wish you and yours a very Merry Christmas and a wonderful holiday season. I’ll catch up with you next week as I plan on sitting down with coach Howard and getting his State of the Union, if you will, on the team and the league. Oh, and Christmas came early to the McCauley household…I did this blog post in it’s entirety on my new iPad. Technology is a blast. The title of this blog certainly comes into play doesn’t it? You may be wondering if this thing is on? It is and I’m still here fresh from a 5 night stay in south Florida. My time away from the IUPUI Jaguars was due to my cousin getting married in Key West. I know, rough life, you don’t have to tell me. The good news for me is I am back and ready to watch the Jags while settling in behind the microphone Friday against St. Joseph’s College. The bad news is I missed one of the greatest single game performances in IUPUI’s division I history. Saturday night I was somewhere on the Atlantic Ocean enjoying drinks, hors d’oeuvre, and time with my family while the Jaguars were at the Jungle facing Western Kentucky. The long time voice of the Jags who preceded me Greg Rakestraw was on the call for the 84-76 IUPUI win. The game tipped just after 7:00 and my first check on the score came at about 7:30. The was about mid-way through the first half and it was a typical slow start for IUPUI. So I stuck thr phone back in my pocket and waited about 20 minutes for the next update. The game was at the half with IUPUI leading 34-25 and I noticed that Alex Young had 20 points. It was shaping up to be a nice night for the Senior, but I didn’t have any idea just how great of a night it would become. My next update came about 8 minutes into the 2nd half and Young was a bucket away from setting a new career high. I sent a text to IUPUI Sports Information Director Ed Holdaway asking if Alex was dominating the game. “Yup, 31 easy points within the flow.” A few minutes later Ed sent me the following text “37, dunk.” 37 points for Alex Young and I was missing it!? He ended the night with a career high 43 on 14-20 shooting making 12 of 13 free throws. It was a night that he needed, the Jaguars needed, and to be honest my night in Key West was something that I needed as well. The question is…is Alex Young heating up? His 43 points was the 6th highest scoring effort in school history and the most in the school’s Division I history. It was the most points for a Summit League player since the 2008-2009 season and the most for an IUPUI player since the ’97-’98 season. If Young is heating up, this is the time for him to get his game back on track. The league’s preseason player of the year is having an up and down campaign. He is scoring 27 per game at home compared to only 11.6 points per game on the road. AY5 is shooting 47% from the floor in the Jungle and only 32% on the road. The Jags will have 3 of their next 5 games in the Jungle with the other set to be play at Conseco Fieldhouse. What an opportunity for this 3-8 club to bounce back and bounce back in a big way. Here is the schedule over the next three weeks: FRI vs. St. Joseph’s, MON vs. Ball State (CFH), FRI 12/23 vs. Valparaiso (CFH), FRI 12/30 vs. Western Illinois (league game), WED 1/3, vs. UMKC (league game). Every one of those game is winnable if the best player on the floor is Alex Young. I’ll be anxious to watch him and the team against St. Joseph’sCollege and see who gets the shots and points within the flow of the offense. From what I understand it was obvious last Saturday was Alex’s night and we’ll see if that trend continues against the Pumas. Not bad at all. Head Coach Todd Howard liked what he saw and hopes there is more from his senior. “He was really on top of his game and it was a quiet 43 because of how smooth he was. He defended, he rebounded, and I thought he was the perfect recipient and finisher.” Coach Howard has tried various ways to grab his star’s attention. Young sat for nearly 10 minutes during an earlier meeting with Ball State and did not start the 2nd half of that game. The most recent message was sent when Young and fellow Senior’s Stephen Thomas and Christian Siakam didn’t start against nationally ranked Louisville. “I was very proud of him Saturday and it followed the shake up against Louisville. He responded with work determination and it ended with a stellar performance.” Minutes before the tip in Louisville, TV analyst Bob Valvano asked me why Young was not starting. My answer was simple…Todd needs to get the attention of his seniors. Bob simply said, “that will do it.” For the moment it worked. A brief survey tells me the best single game performances belong to Odell Bradley’s two 41 against Oral Roberts (2004)…George Hill’s 33 pts, 7 ast, 6 reb performance at North Dakota State (2/9/08)…Hill’s near triple-double vs. UMASS 30 points, 10 rebounds, 8 assists (12/1/07)…and Robert Glenn’s 37 points (15-17 FG) at Drake (11/14/09). Now you can add Young’s 43 to the list. Side note…not listed above is the laundry list of huge games by the school’s all-time leading scorer Carlos Knox. He holds the top five highest scoring games in school history, including the all-time record of 51 points in January 1998. Forgive me Carlos for not putting you on the above list, but you are the Godfather of scoring and deserve your own list. Lost in the Young explosion was the play of sophomore Mitch Patton. He played 23 minutes and grabbed a career high 9 rebounds. Over the last three non-conference games he has played 5 more minutes than Christian Siakam, shot a better FG% than Siakam while averaging 8 points and 5 rebounds per game. The two bigs have different styles and IUPUI will need Patton to continue to improve when league play resumes on December 30th. A best case scenario for the Jaguars is that Siakam duplicates his league numbers from a year ago and the 6-9 Patton gives the added punch of another big man. Two capable big men will go a long way when battling South Dakota State, Oakland, Oral Roberts, and the rest of the Summit League. Assistant Coach Matt Whinrey turned in is resignation days before IUPUI was set to face Louisville. The second year assistant takes a front office job with the Cleveland Cavaliers. The Jags do not have any plans to replace Matt during the season and more of a load will fall on the shoulders of Associate Head Coach Matt Crenshaw and Assistant Coach David Padgett. Don’t expect the team to miss a beat because they can’t afford to look back. The talk entering the Louisville game was to move forward and get ready for the next opponent. As for Matt I wish him nothing but the best. I had the chance to really get to know him last year and the IUPUI bench job was a job he coveted. He has a back ground in the NBA spending some time with the Houston Rockets and long-term he wanted to be in a front office more than on the bench. Nobody expected the opportunity would come this quickly and he could not pass up the chance to move on. Now the question is how will his fiance take the news of moving to Cleveland Ohio? Next week the Jags will have a rematch with Ball State and renew their rivalry with Valparaiso. Both games will be at Conseco Fieldhouse. As of right now they are the only two games the Jags have planned at the Fieldhouse. The Cardinals knocked off IUPUI 69-62 November 23rd in Muncie. IUPUI trailed by just a point late, but failed to convert and BSU hit their free throws to earn the 7 point win. The game against Valpo will be the first between the rivals since 2007. The one-time Mid-Con rivals ended their series when the Crusaders moved to the Horizon League. IUPUI is 7-15 all-time vs. Valpo winning 4 of the last 5 meetings. Hope you can tune in tonight to the game on SportsRadio 1260 WNDE or on your smartphone by using the i heart radio app. As always I’d love to hear from you at mccauleysd@yahoo.com. My travels as a broadcaster for the Indianapolis Indians takes me to some quality cities. I spend several summer nights in Columbus, Louisville, Norfolk, Durham, and it might surprise you to know that Scranton PA isn’t all that bad. All of the cities in the International League offer up unique things, but over the years my travel with the IUPUI Jaguars has taken me on some more memorable trips. My first season the team participated in a three-day pre-Thanksgiving invitational in Daytona Beach. It was an unbelievable set-up with the Arena across the street from the hotel which was located on the ocean. (Can we get the Summit League to move the tournament to Daytona? Sioux Falls is a nice set up and the people are wonderful, but let’s be real. It’s 15 degrees in early March…everyone can get a flight to Orlando and then make the short drive to Daytona Beach. You want students and fans outside of North and South Dakota to show up? Take them to the beach.) 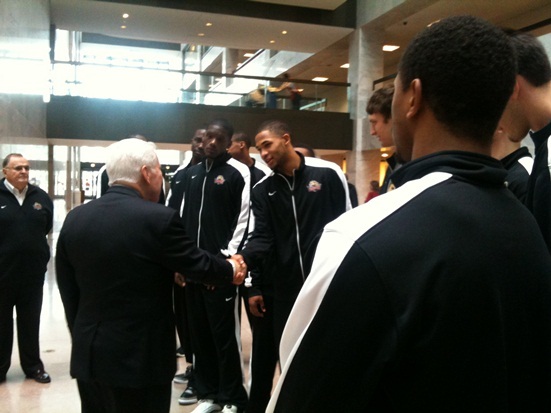 Later that season the Jags flew to New York City to face Hofstra in the CBI tournament. We arrived early on a Tuesday for the Wednesday night games and flew out late enough on Thursday the team could spend nearly 9 hours in the heart of Manhattan. That remains my only trip to the Big Apple and it was a blast. Last season the Jaguars played in a Christmas invitational at a Las Vegas casino and just this past weekend we enjoyed a full 48 hours in Washington DC. 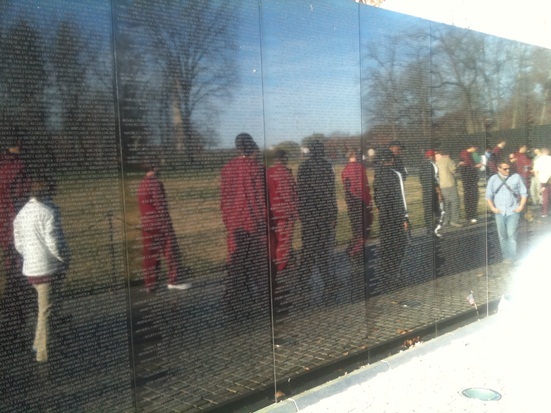 The Vietman Memorial is indescribable and it is hard to explain, but you can feel each and every one of the names. 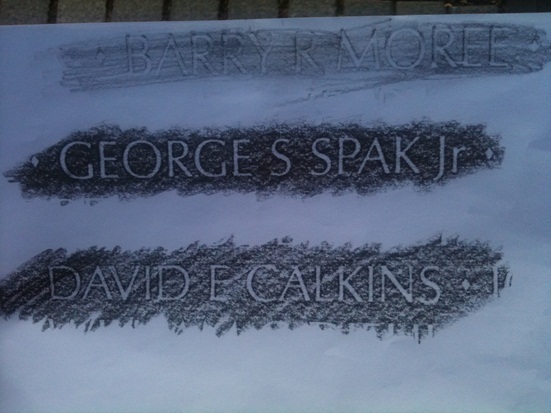 As we stood in the middle of the 58,000 names I text my dad to see if he knew anyone on the wall. Less than 20 seconds later he gave me the names of three high school friends who died in Vietnam. His next text was very simple and to the point, “Do you think you could find them for me?” I don’t know why, but his text hit a nerve and I got a little choked up. It’s not often my dad asks me for something and here he was asking me to find his lost high school friends. It was an incredible 20 minute experience finding their names in the book, looking up their names, seeing the date they died, and then finding their names on the wall. Senator Lugar shared a few stories about the ground breaking ceremony in the late 60’s and how proud he was of what the university has become. I stood off to the side and watch the players and they were locked in on every word and were appreciative he took time out of his morning to spend 15 minutes with them. Coach Howard presented him with a Metros jersey and a Jaguars sweatshirt. 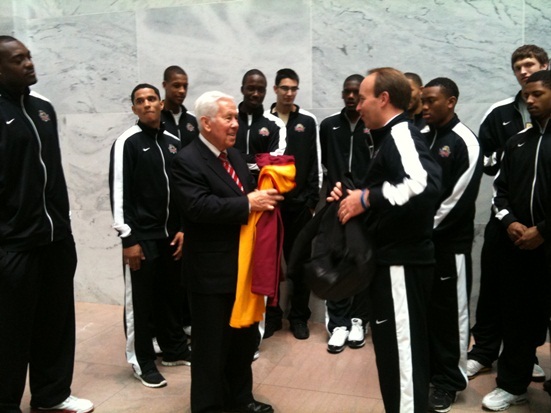 He was touched and gave them a few pointers on Georgetown. 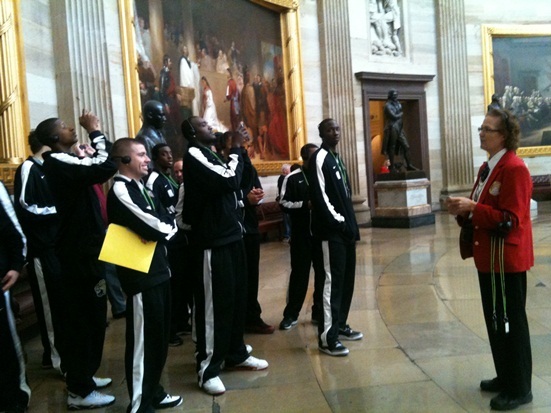 From there it was a tour of the Capitol and off to shoot around. 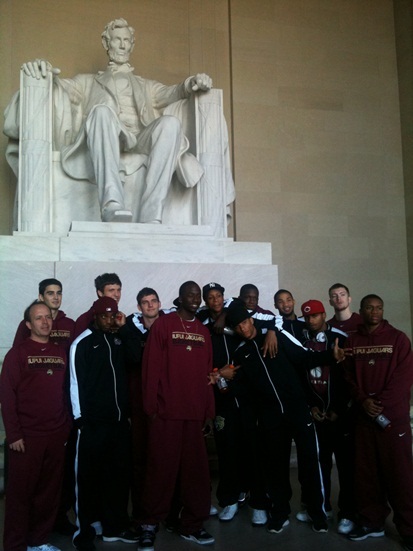 After seeing all that Washington DC had to offer it was time to focus in on the task at hand…the Hoyas. I thought IUPUI played one of the best 20 minutes of the season in the 1st half against Georgetown. They led for most of the half and trailed by only one at the break. The ball movement was there, the shots were falling, and they played excellent team defense. In the end if was not enough and the loss dropped the Jaguars to 2-5. The loss on Monday sent the Jaguars to 2-5 and now they will step out of non-league play and face two Summit League foes in the next 72 hours. The league gives you an early taste of league play in December and then after a three-week break it’s all league play beginning in January. IUPUI will enter Thursday game with South Dakota State 2-5, but a clean 0-0 mark in league play. When you are a mid-major there is nothing more important than winning league games. Are the Jags ready to step into league play? They do not have much of a choice and the good news is they get SDSU and North Dakota State at the Jungle. The Jaguars are 4-0 all-time at home vs. the Jackrabbits and they have had success vs. NDSU. It is only the 1st game, but Thursday game with SDSU will be a big boost to the winner. In the preseason rankings the Jacks were picked 3rd and the Jaguars were picked to finish 4th. Both teams boast All-Summit League players who have the eyes of NBA scouts. For South Dakota State it’s Junior PG Nate Wolters and of course for IUPUI it’s Alex Young. Here is where the winner gets a boast…both teams lost important perimeter players and so far have struggled to replace them. (Wolters has really struggled from behind the arc this season.) IUPUI and SDSU are going to battle for a spot in the top half of the league, but do they have what it takes to grab one of the coveted top two spots in the league? I know it’s only one game, but which star will deliver a win and more importantly an important 1-0 start in league play? We will find out tonight beginning at 7:00. There is no doubt that the Jags have struggled early in the season and playing 4 of your first 7 games on the road can be tough, but IUPUI needs to get something from Senior C Christian Siakam. Siakam finished the ’10-’11 season with a double-double in 4 of his last 5 games. He entered this season as one of the top bigs in the league, but has not found his rhythm through 7 games. That may change over the next two games. For the first time as a starter Siakam struggled early, but turned it on in league play. The hope is this season is a carbon copy of his Junior year. A season ago he averaged 7 points and 6 rebounds in non-league games and 11 pts and 7 boards in league play. His minutes were way up in league play and he was one of the league top offensive rebounders. So far this season he is averaging 8.4 ppg (boosted by a 21 pt effort in the opener) and less than 6 boards per game. Once you get into the league the days of battling 6-11 big men stops and that will be a big help to the 6-7 Siakam. That will be the message Senior PG Stephen Thomas delivers to the Freshman. “The games really matter and you are playing an opponent who knows you inside and out. The intensity level picks up and many times coaches bench will shorten so you have to give your all for a full 40 minutes.” Newcomers Lyonell Gaines, Marcellus Barksdale, and Ian Chiles have been impressive at times during non-conference play. Each player has had a double-digit scoring game with Gaines collecting 1o rebounds in a win against Texas Southern. Now they will play league games and see a more physical style and perhaps a shorter leash. Coach Howard knows how important league games are and often the 10 man rotation you see early in the season will shrink to 8…and even 6 to 7 depending on how close the game is down the stretch. Seniors Young, Thomas, and Siakam need to bring this team together for the next two games to make sure the Jaguars get off to the right start in Summit League play. I hope you can tune into tonight’s broadcast beginning at 6:50 on 1260 am. You can also listen on your smartphone by downloading the free iheartradio app and finding 1260 am in Indianapolis. As always I would love to hear from you at mccauleysd@yahoo.com and you can follow my tweets at twitter.com/ScottDMcCauley.